Home > What Is This Study > What's Involved? Being part of this important Life Course Program will help you learn more about your own health and the changes your body undergoes throughout your life. 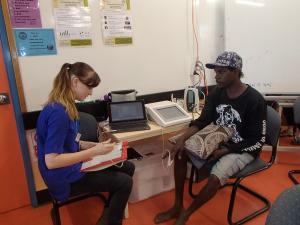 This program is unique to Australia and by taking part, you will help us to find out more about the lives of people who were born in the Top End. The assessments outlined below provide us with a general overview of your health to help us understand which factors are involved in keeping you healthy. Remember it is up to you what assessments you take part in. We would like you to do all of the procedures so that we have complete information on your health, but it is your choice. You can do all the activities or you can choose which ones you would like to do and which ones you do not want to do. If you do all the activities it will take 1.5- 2 hours. A healthy body size is important for overall health and wellbeing. Being overweight or underweight both carry health risks. Being overweight or obese has been linked to an increase of chronic diseases including heart disease, type 2 diabetes, breathing problems, some cancers and mental health. Being underweight has also shown to increase risk of mortality. Your body will grow at different rates throughout your life. 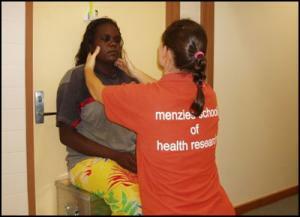 We would like to see which parts of your body change over time by measuring your height, weight and sitting height. We would like to measure how tall you are. We do this to see how you have grown over time and we also use it with your weight to calculate your BMI (Body Mass Index). We will ask you to stand barefoot with your back against a wall. It is important to have your feet together and heels against the wall. We may ask you to remove any hair ties temporarily. We will then record your standing height with a special measuring tape called a stadiometer. Tanita scales sends small electrical current and can measure from the resistence your current weight and how much of you is muscle, water and fat. 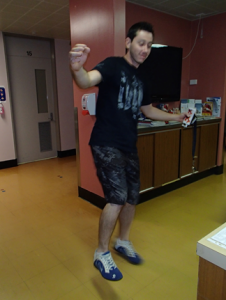 We ask you to stand barefoot on the Tanita scales.The scales may feel cold but no electrical current can be felt. Body Mass Index (BMI) is a useful measure of body size. It is calculated from your height and weight. 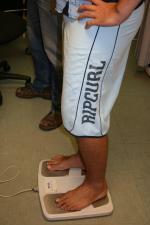 Once we have measured your height and weight, we can calculate your BMI. We will then show you a chart of where your current BMI sits for your age. Your sitting height is a meaurement of your trunk length. Your trunk length will triple in size from birth to maturity. We would like to see how it has changed over time. Sitting with your back to the wall on our study box, we will record your sitting height. We then record the box height. This will then give us your trunk height. Each person's body shape is unique and changes over time. We would like to see what your current body shape is and how it has changed. We are interested to see where your body stores fat and muscle and how this may impact on your health. Waist measurement is a good estimate of how much body fat is carried around your middle. It can be used along with measuring your BMI to look for any health risks. Your waist is located midway between the top of your hip and your lower rib. We may ask to make a small pen mark at your waist. 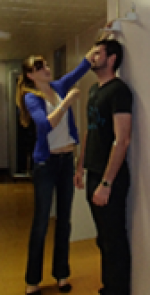 In privacy, we will then measure your waist with a tape measure. Your hip circumference is located over the widest part of your buttocks below the top of the hip. We measure around your hips by using a tape measure. It should feel firm but not tight. Your arm length and circumference are measured to see how it has grown and find out how much fat and muscle is stored here. With your arms relaxed by your side, we ask that you bend your right elbow so that your arm is at right angle and your lower arm is parallel to the floor. We will then measure from your shoulder to your elbow. We will then ask if we can make a small pen mark halfway between your shoulder and your elbow and use this mark to measure around your arm. Head circumference reflects brain size and grows rapidly in our early years. We would like to see how big your head is and how it has grown since last time. Standing with your left side of your face towards us, we wrap a tape measure around your head and record how big it is. We may ask you to remove any hair ties before we start. The health of your heart is very important as cardiovascular disease affects many Australians. We would like to see how healthy your heart is by measuring your blood pressure, by looking at the important blood vessels for any fatty deposits with an ultrasound machine (carotid ultrasound), measuring heart rate variability and arterial stiffness with the HRV/DPT machine as well as collecting blood to look at any early indicators of cardiovascular disease. Blood pressure is a common procedure and is used as an indicator of how much strain is in your blood vessels. It is measured as the systolic pressure over the diastolic pressure. 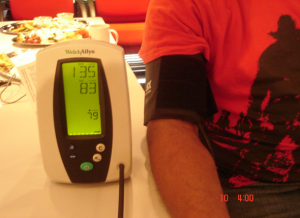 Whilst sitting, the blood pressure cuff is placed around your right upper arm. The cuff inflates and becomes tighter then goes down. We would like to repeat this process to get a good reading. The cuff feels tight for a few seconds as it inflates. Everybody's heart rate varies with each heart beat. 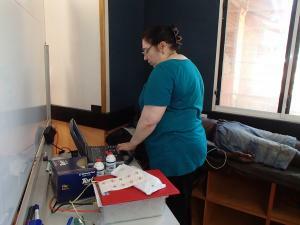 The HRV machine reads your heart rate and measures the variations around each beat to beat. The HRV of a healthy heart is usually large at rest. Some factors such as stress and exercise will cause the HRV to decrease. 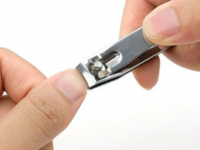 A plastic probe is placed on your index finger. A red light will pass through your finger and the attached computer will read this. It will take a few minutes for the computer to then display your HRV measurements. There is no pain but you will have to stay still for a few minutes while it reads the trace. Another way to check that your blood vessels are healthy is using the DPT machine. 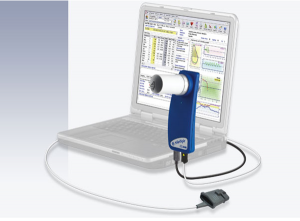 It uses the same probe and computer as the HRV machine. The red light in the finger probe reads your pulse at your finger. It then measures your pulse wave form at your finger on the computer and calculates how stiff your arteries are. 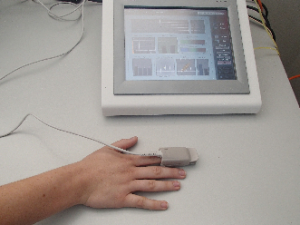 Using the same plastic probe as the HRV machine, the computer measures the HRV and DPT at the same time. You just have to remember to stay as still as you can while it takes the reading. This is the same machine that is used to check babies and you may have seen it before. Our doctor will use the ultrasound machine to check the main artery in your neck called your carotid artery for any fatty deposits. Using the ultrasound machine, our doctor will apply some cool gel to the probe and place it on the side of your neck. The gel may feel cold and wet but there is no pain involved. Using the same ultrasound machine, our doctor will check the health of your kidneys. The ultrasound will take a picture of your kidney and our doctor will examine the ultrasound to make sure it is working well. 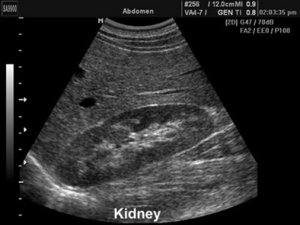 The ultrasound will measure the size of the kidney, check for any scars or stones and check the collecting system. There is no need to remove clothes and you will be given privacy at all times. Our lungs are part of our respiratory system and help us to breathe in air which contains oxygen and other gases. Once oxygen has reached our lungs it is then circulated through the blood stream to every cell in our body. The health of our lungs are therefore very important. As part of your health check, we would like to see how healthy your lungs are. We check to see how well your lungs are working by using a spirometry machine which is the most common of the lung function tests. First, you breathe in fully and then seal your lips around the mouthpiece of the spirometer. You then blow out as fast and as long as you can until your lungs are completely empty. You need to take a big breath out and sometimes you might feel a little light headed. Eating a healthy diet throughout your life influences the way we grow and develop and may prevent some chronic diseases. We would like to see what your current diet consists of. We would like to record an estimate of your food and fluid intake for the past 2 weeks. From our flip chart, we will see what fruit, vegetable, meat, soft drink, fruit juice, milk and takeaway you have had. 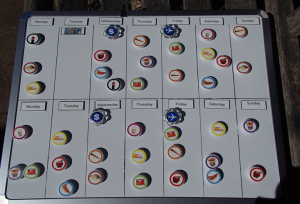 On our whiteboard, we will place a magnet on the days you ate or drank them. Lifestyle plays an important role in our health. Influences on our current and long term health such as exercise, smoking and drinking may change throughout your life. We ask questions about the amount and type of exercise you do. We also ask about smoking and drinking alcohol. These questions are part of a questionnaire on our computers. You will be given privacy and explanations of any questions where needed. Finding out about your housing, family and financial status help to build a bigger picture about the external influences that can affect your health and the health of your family and community. We ask questions about your education, where you live, how many people you live with and where your money comes from. These questions are on a computer and are kept private at all times. You can test your memory and reflexes by participating in our card game. This is a game that tests your reflexes and memory using playing cards on a computer. Grip strength is a good indicator of overall muscle mass and has been shown to be an important predictor of future physical function, cognitive function and age related diseases, and may have practical implications in assessing and modifying your future quality of life. We would like to measure your grip strength, your leg strength and balance. 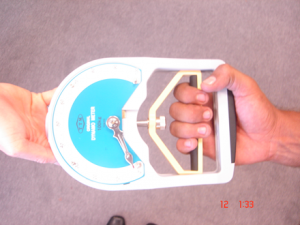 We would like to test the muscles in your hand using a portable grip strength machine called a dynamometer. Using your dominant hand first, grip the machine with your hand and pull back on the bar of the dynamometer as hard as possible. We will record your grip strength. We will do this for both hands. Chair stands are a good way to measure your leg strength. We count how many chair stands you can do within 30 seconds. Holding your body in this positon with your eyes closed for 30 seconds is tricky and can test how balanced you are at the moment. Standing on one foot, we ask you to close your eyes. We then record how long you can stand in this position without opening your eyes. The aim is to make it to 30 seconds. Blood, urine and hair and nail samples can help us see how healthy your body is from the inside. 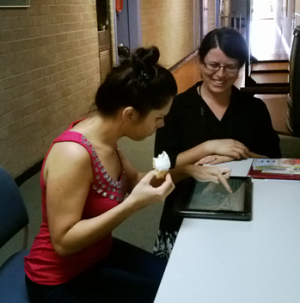 If you choose to have these samples collected, we can see what your physiological and biochemical state is currently. 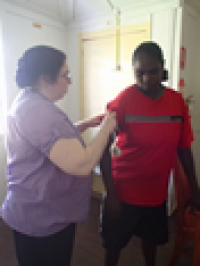 We ask to collect blood samples to do a range of tests such as; cholesterol, haemoglobin, hepatitis B, body fats, glucose, iron studies and CRP. This will tell us if you have any early signs of chronic disease. You will be offered a numbing cream called Emla to numb the area on your arm. You should feel a dulled sensation to the area once it is numb. After a band is tightened around your arm, we will insert a small needle into your vein and collect some blood into a tube. We can check and let you know what your blood suger level is immediately. You may feel some pain but if the cream works well you should feel no pain, just a dull sensation. What will we do with the blood? We will store the blood in the Menzies freezers until it is sent to interstate laboratories in batches for testing. A small amount of urine can be used to see how your kidneys are functioning. We are also testing the level of tobacco smoke in your urine. We will ask you to provide a midstream urine sample in a yellow lid container. What will we do with the urine? We will store the urine in Menzies freezers until it is sent to interstate laboratories for testing. We can see what your stress levels are like by measuring the amount of cortisol (stress hormone) in you hair and fingernails. With your consent, we will cut a small piece of hair from the back of your head and a corner of your finger nail. What will we do with these samples? We will store the hair and nail at Menzies until it is sent to interstate laboratories for testing.